The appearance of blood under a toenail can closely resemble a melanoma – and vice versa. Here is a comparison of the differences and similarities. “Both can cause pigment in or under the nail, but unlike a subungual hematoma, a melanoma is usually not painful and is not linked to an injury,” begins Hadley King, MD, a board certified dermatologist who specializes in medical and cosmetic dermatology. “Also, a subungual hematoma usually affects the nail of the great toe and may affect multiple nails, often with bilateral great toe involvement if it’s from ill-fitting footwear,” continues Dr. King. The dark smudge-like pigment is somewhat curved on the sides closer to the nail fold or “bottom” of the nail. 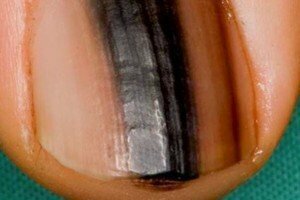 When a person first notices the pigment, it’s usually soon after the trauma that caused it – when the discolored area is visibly making contact with the bottom or cuticle area of the nail. In addition, the pigment does not extend further beyond this bottom area where the skin starts. This means the area of dried blood (which is why it’s very dark or black) can have more of a smear-like shape than an outright band or stripe. Note: Not all toenail melanomas are shaped like a band, stripe, streak or line. Sometimes they can appear like a smudge or smear as well. “And a hematoma will grow out,” says Dr. King. This is an extremely reassuring sign that the dark blob under your toenail is just some old blood. However, waiting for it to grow out can be agonizing, since toenails seem to grow so slowly. “Melanomas are usually asymptomatic and only one nail is involved,” continues Dr. King. “Pigmentation may extend to the tip of the finger or toe, as well as to the nail fold, Hutchinson’s sign.” The next three images show this. “The thumb or great toe are most commonly affected. It often presents as a new linear pigmented band along the length of the nail, which starts to widen progressively and becomes funnel stamped with the widest end proximally [towards the “bottom” of the nail]. Association with trauma. The trauma that leads to blood under a toenail isn’t always blunt and painful at the time of occurrence. It could be as seemingly innocuous as jogging downhill in footwear that isn’t roomy enough. 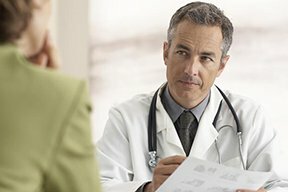 The patient might not even recall the trauma. Though subungual hematoma often affects both big toes at the same time, it CAN occur in only one toe. If your right foot is a little bigger than the left, the shoe on your right foot will have a tighter fit that may result in a hematoma, while the shoe on the left won’t. More than one toenail. 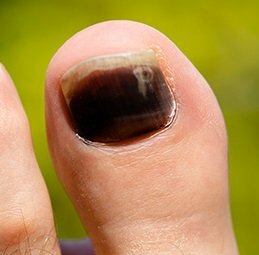 If the appearance of the dark pigment in a big toe coincides with a similar-looking pigment in another toe – either on that foot or the other – then this points to a benign cause. Blood grows out. 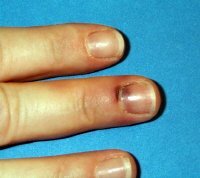 If you view a hematoma every several days, you’ll notice that the space between the portion closest to the cuticle and the cuticle is getting bigger, or showing more nail. As the nail is pushed out, the blood underneath goes with it. So if you noticed the pigment when it was first visibly “connected” to the cuticle area, in a few weeks it will be closer to the center of the nail, then after several more weeks it’ll be near the top of the nail. It can take several months to finally grow out. Eventually the nail will be long enough such that when you trim it, you’ll also be trimming out the old dried blood. If your nail is trimmed short enough, this might expose the old blood, and you’ll be able to gently remove it with the tip of a toenail trimmer. You wouldn’t be able to do this with a tumor. A tumor would never easily crumble away when prodded with a toenail trimmer – not any more than a common mole would crumble off if you did this. A melanoma will stay firmly adhered to its place – it will not move “upward” as the nail grows. Hutchinson’s sign. Cancer will spread laterally but also spread into surrounding skin (if not treated). A subungual hematoma may initially seem to include some surrounding skin (whether big toe or finger), but over time, the bruising will regress. Old blood and bruising under a nail. Note what appears to be a Hutchinson’s sign. 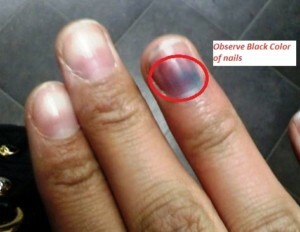 But over several weeks, it should fade, while the patch of dark on the nail should move upward as the nail grows. If it spreads or progresses into any area of skin, or starts appearing in a new area — this is a very worrisome sign. Non-linear vs. linear shape. A toenail hematoma is not a band or stripe (but remember, a melanoma CAN present as non-linear and appear like a patch, smear or smudge). Melanoma will typically appear composed of vertical bands. Melanoma. Note the variegated banding plus the Hutchinson’s sign at the top of the nail. Melanoma. Note the sharply demarcated border between the tumor and the nail, and the perfect rectangular shape of this thick band. Pain. If you press on the subungual hematoma, you’ll likely feel discomfort – but absence of discomfort doesn’t mean it’s malignant. Nail damage. If there is any appearance of erosion, nail destruction, crusting or other degradation of the nail unit, this is never suggestive of a subungual hematoma. 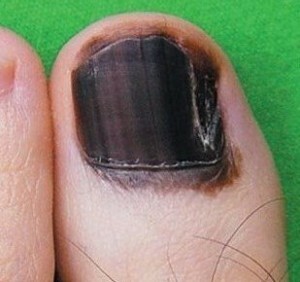 However, if the toe is traumatized enough, the dark or black pigment will be under the whole nail — and eventually, the nail will start getting loose and will fall off — revealing a brand new nail beneath. Sudden appearance. A subungual hematoma will come out of nowhere. It’ll seem to arise overnight, the size of a pencil eraser even. Early nail melanoma that’s still invisible would never suddenly appear at this size.